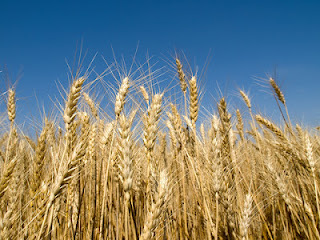 Growing up in the farmlands of Kansas, I thought local farmers held the patent on growing wheat. With miles of green fields in spring, turning to golden waving heads of grain just before the summer harvest, we heard the motto, “Kansas the Wheat State,” often. My maternal grandfather and uncles Frank and Jesse were typical Kansas wheat farmers, constantly worrying about the weather, wheat aphids and the markets, early risers who worked well into the night when farming needed done. I recall my grandfather standing at the door watching clouds drift in, concerned about whether a summer rain might arrive before he completed harvest or hopeful for winter snow when the tiny wheat seeds needed nurturing moisture. Weather rules farm life. As a child of town dwellers, I spent many summer days visiting aunts and uncles on their farms, and later when my adult life allowed, I showed up at my Uncle Jesse and Aunt Polly’s farm in mid to late June so I could help with wheat harvest. Jesse and I would spend the day turning circles around the field, taking turns at the combine’s steering wheel, the machine’s grain wheel turning in front, separating the grain from the straw and the tossing it through a screen into the grain tank. Every so often, we would meet up with Aunt Polly, the designated truck driver, dump the grain and start our circles all over again as Aunt Polly headed for the elevator to dump and return, ready for the next load. We all three would end the day at dusk, tired, black of face and hands, straw filling our hair and pant cuffs, but feeling accomplished and satisfied. After a tornado hit Polly and Jesse’s farm, picking up the combine and sitting it on top of their mobile home while they held each other and prayed inside, Jesse announced that, “It must be time to retire.” They sold the farm, ending their wheat harvesting days along with my own. Recently, while researching Middle Eastern cuisine, I learned that, gasp!, Kansas does not hold the patent on growing wheat. According to Wikipedia, the first cultivation of wheat happened in the Middle East, specifically Iraq and Jordon, as far back as 9600 BC. The Middle East also takes credit for discovering the fermentation process for making bread and beer, and the first cultivation of barley, pistachios, figs, pomegranates and dates. 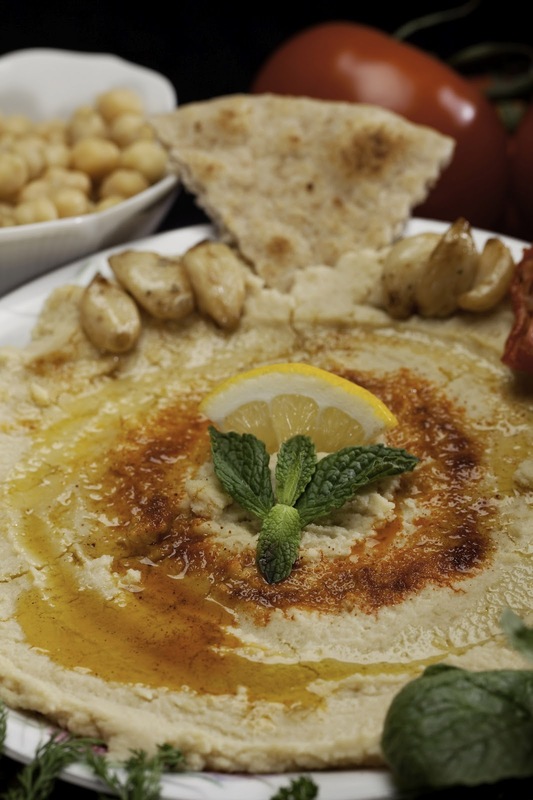 Middle Eastern cuisine, sometimes known as West Asian cuisine, uses a wide variety of ingredients, including tahini, a paste made from hulled sesame seeds, and chickpeas, also called Garbanzos, both used to make hummus, a lovely, healthy snack that I like to make and freeze in one-serving portions. You can spread humus on many things, including pita bread, tortilla chips or crackers, but I like to make whole-wheat flat bread that I also freeze. Hummus recipes abound on the Internet, but I base mine on one I found on about.com, a site that features Middle Eastern Food, among other things. 1 16-ounce can Garbanzos (chickpeas), drained, rinsed and dried with a paper towel. Place dried chickpeas, lemon juice, olive oil, garlic and spices in blender. Blend on high until smooth. Add tahini or sesame oil and 2 tablespoons of water. Blend until well mixed. Add third tablespoon of water if you want a moister consistency. Serve at room temperature. Storage tip: I place about 2 tablespoons of prepared humus in ice-cube trays that have been coated with non-stick spray or olive oil and freeze for 1-2 hours or until solid. Dump cubes into freezer bag to store in freezer for up to two months. When ready to use, thaw in refrigerator, but remove to counter and bring to room temperature before serving. 1. Mix flour, salt and baking powder in bowl. 2. Stir in water and oil to make moist dough. Knead 2-3 minutes and shape into round ball. Cover with plastic wrap or a dishtowel and allow to rest 40 minutes. 3. Cut into 20 pieces and shape each into a small ball. 4. Working on a lightly floured surface, roll each ball into a 5-inch circle. 5. Cook flatbreads one or two at a time in a hot, cast-iron or heavy non-stick skillet until bottom becomes spotted brown, 1-2 minutes. Flip and cook second side 1-2 minutes. Serve while warm. Chef’s note: I prefer organic white whole-wheat flour available at kingarthurflour.com/flours. Storage tip: To freeze, lay cooked flatbreads on parchment-paper-lined cookie sheet and place in freezer for 15-20 minutes or until stiff. Place frozen flatbreads in freezer bag and store in freezer for up to 2 months. As an alternative, place pieces of wax paper between slices of flatbread and place in freezer bag. To thaw, place on paper plate, cover with a damp paper towel and microwave 30 seconds.